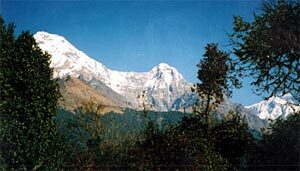 The Langtang Himal is a region north part of Kathmandu vally and it lies just south of Tibetan border. The langtang valley is surrounded by high peaks of great appeal. It has become famous ever since the British mountaineer Bill Tilman described it as the most beautiful valley in the world. The highest peak in this area is Shisapangma or Gosaithan 8027m in Tibet. The course from the Langtang valley to Gosaikund is full of diversity and it is attracting many tourists. The langtang valley is also know as the treasure house of Alpine plants. The whole valley is cover with flowers during the summer.This high and isolated region is inhabited by Tamangs whose religious practices, language and dress are much more similar to Tibetan.